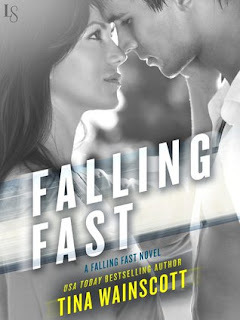 Today we have an excerpt from Falling Fast by Tina Wainscott, a new contemporary romance from Loveswept. Raleigh West washed the grease off his hands. Not the way he usually did, with the soap that erased it completely, but enough to get the slickness off. He still had another hour or two dyno-tuning the black Corvette in the garage. The customer autocross raced it, and Raleigh promised it would be sexed up by the weekend. He glanced up as Paxton Sullivan sauntered into the garage in his officer’s uniform. Pax didn’t usually come by when he was on duty. Of course, he always looked a little “off-duty,” with his wavy hair a tad too long and his lazy smile a little too laid-back for a cop. Raleigh was surprised he’d lasted this long. “I bought the car because it looked purty,” Raleigh said, imitating him. He’d tried hard to eradicate his southern accent. Pax, from more money than he came from, could afford to keep it without being judged as white trash. Raleigh fought the tingle in his eyes by jabbing his fingers into them. “I know she was older, but she was feisty. Full of life.” He never thought about her dying, even though she talked about it. And she was so damned nonchalant, too. Pax was talking about Mia. Mia, here. Raleigh didn’t think his heart could beat any slower after hearing about Nancy, but apparently it could. He fought not to close his eyes and sink into the bittersweet ache Mia’s name evoked. What would she look like now? She’d be twenty-four. Grown up. “Thanks for letting me know,” Raleigh said. Pax patted Raleigh’s arm and headed out. Raleigh stared off into the dark long after Pax’s taillights disappeared into the night. Twin emotions battled inside him. Nancy gone. The woman who’d been like a grandmother, when she should have hated him the way Mia’s parents did. Nancy wrote to him shortly after his incarceration, giving him an update on Mia and assuring him that she would survive. Nancy figured Raleigh must be frantic not knowing how she was. Both the update and the kindness behind it brought tears to his eyes. His thank-you letter had started a continuous correspondence that made all those days and weeks and months tolerable. News of Mia’s treatments, her progress, her victories. After his release, she invited him over for a home-cooked meal. That was when he noticed the loose boards on her front steps, the latticework that needed staining. He’d volunteered to fix them. They shared another meal when he had. He spotted more things that needed fixing. And, over time, they’d become friends and, in a way, family. Better than any family he had. She had fed him pictures and news about Mia over the years. Not many pictures, and most of them dimly lit or long-distance shots—the only ones Mia would allow, apparently. Mia had finished high school with private tutoring as she’d healed, though she’d managed to walk across the stage. Raleigh had pretended mild interest in Mia’s life, but Nancy probably saw the way he devoured every tidbit. Now she was gone. His friend. Surrogate grandmother. Link to Mia. Then there was the other emotion fighting for dominance inside him: hope, with a heavy dose of fear. Seeing Mia would be heartbreaking in a different way. How scarred would she be? How angry at him still? He could remember the pain in her voice during the one phone call they’d had since the accident. She’d barely given him a chance to say how sorry he was for letting her ride with him that night. Sure, she’d wanted to, but he should have said no. He couldn’t refuse Mia anything, with her hunger for speed and life and him. He’d been as intoxicated by her as she was with him. Speed had nothing on the way she made him feel, how she felt in his arms, and the way she’d come alive beneath his touch. They’d been in love the way only a seventeen-year-old and a nineteen–year-old could be—fully, recklessly, unwilling to think about the thirteen hundred miles they lived apart, the million miles of social class between them. After the call, he’d sent a couple of letters, needing to say that he was sorry. Still no response. Nancy suspected that Mia’s parents were intercepting them. He’d even joined Facebook, something he had no other use for, just to see if he could find her on there. No luck. So he’d settled for Nancy’s updates. He headed over to the ’vette, but work wasn’t in him now. He closed everything up, parked the car outside beneath the metal roof he’d installed out back, and got into his 1970 Barracuda. The engine rumbled like a caged tiger. Giving in and buying a muscle car—not a good idea, especially with the new 4bb carburetor that bumped the horsepower to over three hundred. It whispered to him, wanted to lure him into jamming his foot down on the gas pedal. He needed to drive by Nancy’s cottage one more time. Maybe sit out on the deck and remember the times they had shared lasagna after he’d been painting all day or refinishing her wood floors. That was the only payment he accepted, her home-cooked meals and her friendship. He pulled down the gravel road that housed five cottages built in the sixties. One of them was in the process of being torn down, no doubt to be replaced by something shiny and new. The small Panhandle town didn’t boast wide, sugar-sand beaches. The scrubland in this area, with its sea-grass-covered dunes, hadn’t been developed as it had farther west. But, with the economy recovering, Chambliss was now seeing the results of the dredging project begun years ago. As he neared Nancy’s home, his heartbeat spiked at the sight of two cars parked out front, lights blazing inside. Mia and her parents, he bet. They’d probably just arrived, given the luggage in the open trunk. He paused, even though he knew that he should back up and leave. Except he couldn’t, because the front door opened and a woman stepped out. His heart tripped and coughed and gasped like a gunked-up carburetor. Mia. Her dark-brown hair was piled up on her head, loose strands framing her face. She stepped off the front porch and out of the light, but in that brief glimpse he could see her tired, sad expression as she headed toward the open trunk. Which would put her only a few yards away from his car. He still couldn’t lift his foot from the brake pedal. His windows were tinted, so she wouldn’t see him. He couldn’t see her as well, either, but he saw enough as she hefted out the black suitcase. Now his heart was racing, seventy, eighty, a hundred miles an hour. She wore a red top, one sleeve drooping off her shoulder, and shorts. Still trim and long in the torso. Still about five-five. It was her face, what he could see of it in the distant lighting, that gripped him. In this light, as beautiful as ever. Memories flashed through his mind like a slide show: her laughing; smiling shyly; closing her eyes and arching as she came beneath him. Whispering his name, her fingers digging into his back. She looked up then, her gaze zeroing in on his car. Her eyebrows furrowed, and she tilted her head in the way he’d seen a hundred times. Something inside him screamed to lower the window and say something. Hello. How are you? I’m so sorry . . .
She turned to glance behind her, where her father was coming down the steps. Raleigh hit the gas and shot forward to the end of the lane, where he had to pry his fingers from the steering wheel to put the car into park. He was shaking. Dammit, he’d almost screwed up. Talking to her would only dredge up a painful past for Mia. Maybe her anger, too. Her father would have blown a gasket. Mia didn’t deserve to suffer anymore over him. He forced himself to breathe normally and pull around the small cul-de-sac. As he passed Nancy’s cottage, he vowed that he wouldn’t look. But he couldn’t help it. Everyone was inside, the cars closed up. He told himself it was for the better. That maybe he shouldn’t attend the funeral after all. How the hell was he going to handle seeing her without a tinted window and the night between them? Falling Fast by Tina Wainscott is a contemporary romance, released by Loveswept on June 16 2015.